The Burgeron children have been playing and preparing for the Bovine County Fairy Tale Festival. Some more patiently than others. Our evening story time has been a big draw for the little ones, not to mention all of the reading going on at quiet-time every afternoon. I’ve got a whole book shelf of old illustrated fairy tales left to me by my grandmother that the kids can borrow. You might enjoy checking out some of the on-line fairy tale collections that the older kids have found and recommend festival goers have a looksie. The rules can be rough. Just like they like hearses. Will we swarm like hives? is what this zombie needs. It was a long day yesterday running & hiding from all those Zombies. I’ve managed to keep myself alive along with a few of my friends. My safehouse at #NanasPlace was a life saver indeed. Using Storify I was able to capture our conversation to share with you all. Those Zombies didn’t get us, but they were lurking right outside. We could hear them. Begging for body parts…… tsk, tsk…. I was so exhausted that I slept through the night. I wrote down some notes for today just before I nodded off. 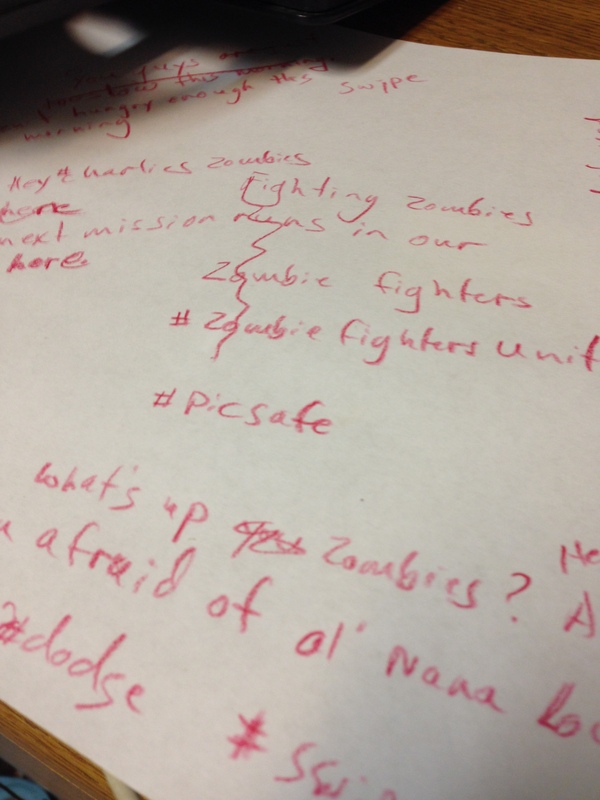 I posted my #picsafe (A photo taken during the game and tweeted to #TvsZ gives humans immunity from Zombies as long as they are quiet.) kept me safe throughout the night. That horrible Zombie horde must’ve been tired after all that carnage. They were pretty quiet last night. But the morning rays did not bring peace to the Burgeron Family trailer. We are still vulnerable. There has been talk of antidote, but we humans are skeptical. I doubt there are too many synthetic organic chemists among their lot. And the humans are too busy just surviving to hang out in a lab. And what about test subjects? Now that would be a tough one. Those Zombies would have no problem with biting the hand that feeds/cures them. We are going to continue to need safe places to hide out until either we succumb to the Zombie infection or a cure is found. It’s up to us remaining humans to do all we can to help the human race survive. No tough guys left in Bovine County to protect us any longer. “Tough guy” Jean-Claude Van Damme ran away yesterday along with the Burgeron sheep leaving the #sheepshed as a #TvsZ #safezone for us. Oh the horror of it all continues. Read all about it in the post by my grand daughter Rochelle Louridge reporting on my #TvsZ Zombie day. Those Zombie hordes swarm down on you at any chance they can get. While we humans shiver in fear, remaining silent in the darkest of places, they go on biting and munching their way around the globe. The infection is spreading so fast. We humans can barely keep up. But I’ve got a thing or two up my sleeve. I’m preparing a #safezone right now at my place next to the Burgeron Trailer. Those Zombie heads on spikes should keep them at bay for an hour. Nana Lou’s place ready to be a #safezone for the humans at Twitter Vs. Zombies 4.0. The Zombie heads providing further protection. I’m currently hiding out in another human’s safe zone Rhonda Jessen (@rljessen) and have a few minutes left to tell the family what I’m learning today. As this is the first official day of our DS106 Summer 2014 Burgeron Family collaborative storytelling experience. Zombie head hacked off by Nana Lou during Twitter vs. Zombies. Taking part in this Twitter vs. Zombie thing was a last minute decision. I was worried my old age would keep me out of really playing the game. But no way. Your ol’ Nana Lou has been hanging in there like a pro. 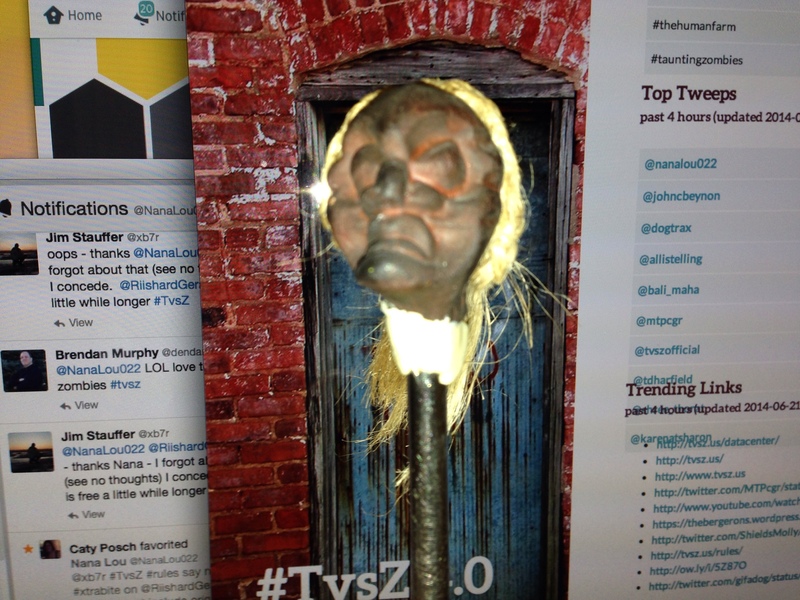 I was at the top of the 4hr tweet report when this Zombie attacked and I chopped his head clean off. Put it on a spike along with a few of his buddies and placed them around my place as a warning to stay away. The speed at which this apocalyptic event is occurring is what has taken me by surprise. I have to stay on top of my game at all times. The rules are severly slanted toward the Zombies and since I’m still human the rules don’t allow for me to have much playing time. I sit back, watch, learn and strategize. We were given a #picsafe (take a picture during game play and post it with a tweet) this morning that allowed immunity from bites as long as we didn’t say anything. This gave me the 60 minutes needed to regenerate my #dodge and #swipe defenses, but it also meant I had to stay quiet and couldn’t really play. Zombie Selfie taken today at Stonehenge. The infection is spreading fast. Well I didn’t sit idly by. I went about taking photos of things I thought would come in handy like this Zombie “selfie” at Stonehenge. 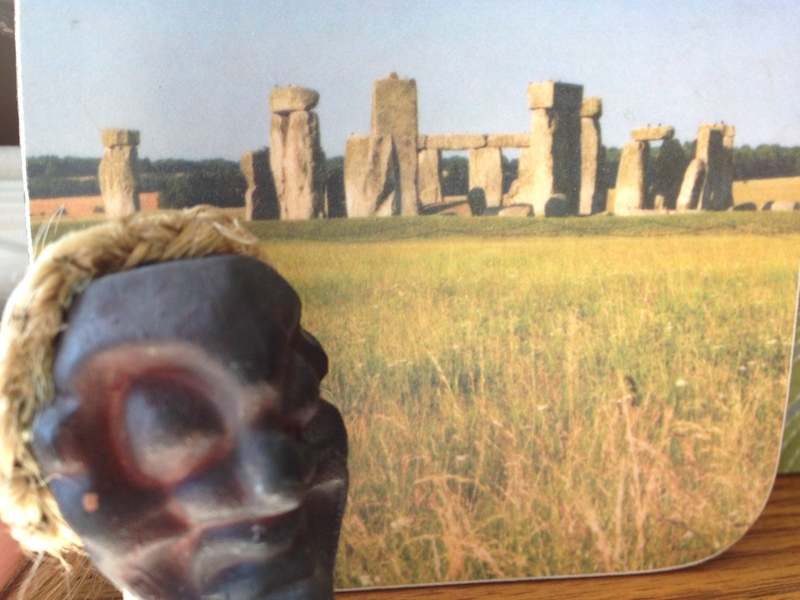 I took Surfer Dudette’s head and placed it in front of my Stonehenge coaster and snapped the picture. Pretty clever if I don’t say so myself. I’m new to this Zombie thing. While for some this is their 4th round of #TvsZ. I had to ask a lot of questions. It’s nice that they give us humans a chance to remain safe with a #rules in our tweet. I’ve been able to help others by answering their questions too, which helps me to feel like I’m still a part of the game. I’ve also been favoriting tweets that I like. Letting other players know I’m still here. Just in hiding. Even some of the Zombie tweets and pics were entertaining. I’m an equal opportunity kind of gal. They got favorited too. I like this game. It is teaching me how to do things quickly. Like writing this post. Normally I take forever writing something up to get it just right. 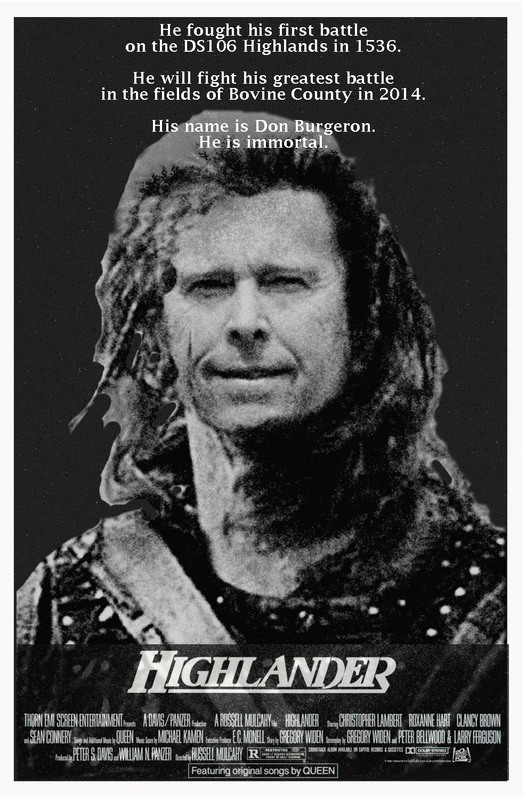 But I’ve got less than 10 minutes now to get this posted and tweeted before my current safezone is overrun by the Zombies. I don’t really like having to sit back and hide like this. I’m hoping there will be a rule change that will allow us to #Chop or #Hack or #Stomp on a Zombie. I know the undead can’t be killed again, but we could at least stun them and make them wait 15 min to regenerate. I’m getting ready for a full out offensive. 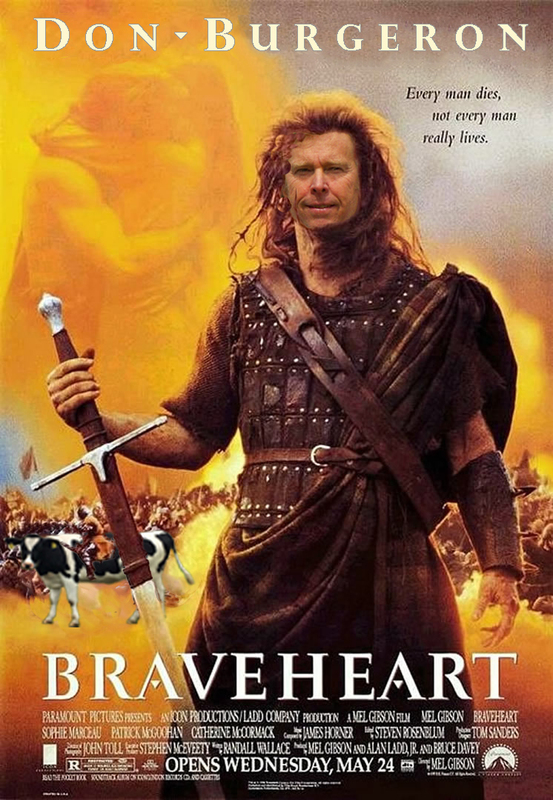 I’ve already called in the Bovine Zombie Stomper Special Forces unit (BZSSF) to help us out. Bovine Zombie Stomper Special Forces (BZSSF) unit to the rescue. Nana Lou wants to know who’s coming.